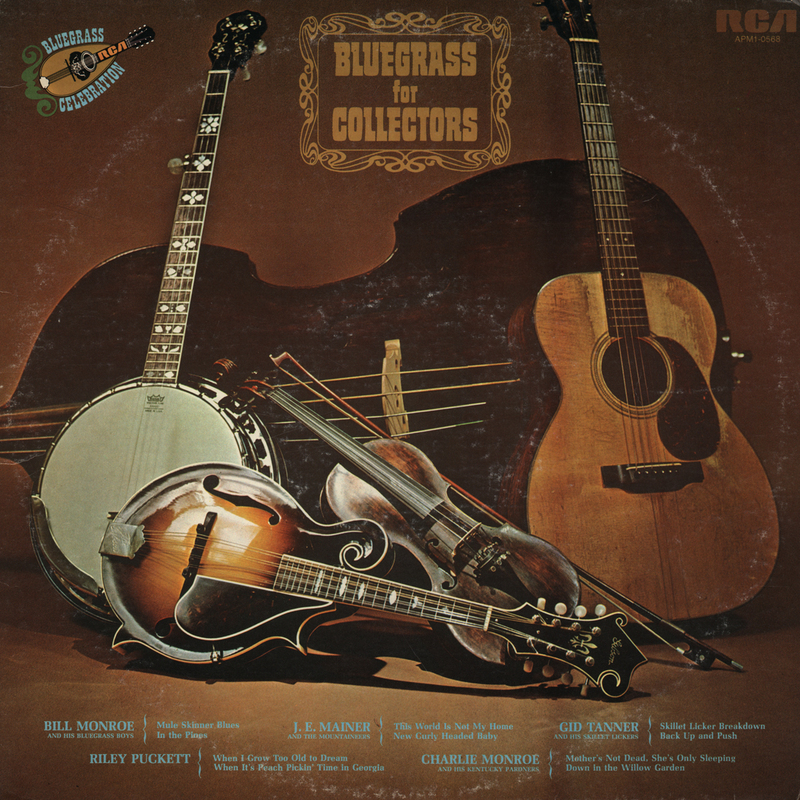 Continuing in the vein of recent posts, here is another vinyl era reissue of great vintage roots recordings from the RCA Victor catalog, the 1974 offering "Bluegrass For Collectors". None of the ten songs comprising the album are exactly bluegrass; even the Bill Monroe tracks are from his 1940/41 pre-banjo Atlanta sessions. It is, however, a stellar collection of the type of southeastern old time and country music that was highly influential on the development of bluegrass music, perhaps that where the "For Collectors" angle comes in. At the very least this LP is a worthwhile compilation and a thoroughly enjoyable listen! Alan Lomax called Bluegrass “Folk music in overdrive.” Its fast tempos, close harmonies and banjo melody lines give it an excitement that has been rediscovered by those old enough to remember its evolution in the late 1930s and early 1940s. Bluegrass has also been newly discovered by young Americans who have elevated it from an underground music to one of the newest and most popular attractions on the college campus. Thanks to the dedication of a few country musicians—most notably Bill Monroe—who refused to add to this music new electric amplification for their instruments, Bluegrass today remains pure and little removed from the styles of its origin, the music retains the elements that made it the people’s music of the southern Appalachians. Certainly the invention of the phonograph from a musical standpoint is nothing short of phenomenal. And with this ability to indefinitely preserve music and musical performance has developed a new breed of men whose interests lay not only in “what’s new” in music but in its past glories. They are the keepers of the flame. They are the record collectors and sometimes it is the collector with his hoard of old records who has been the only remaining source for certain performances. 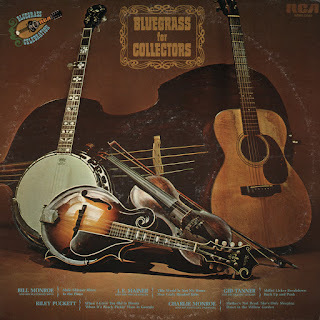 To the serious collector then, this album of timeless Bluegrass treasures is most sincerely dedicated. And to these collectors we furnish below the all-important vital statistics concerning this impressive assemblage of Bluegrass stars and their recordings. BILL MONROE AND HIS BLUEGRASS BOYS recorded Mule Skinner Blues in Atlanta on October 7, 1940 in a session that produced seven other songs in a short two hours and fifteen minutes. Bill revived the Jimmie Rodgers tune with the help of the Bluegrass Boys; Clyde Moody’s guitar, Tommy Magnes’ violin, Bill Westbrook’s bass and Bill’s own mandolin. Almost one year later, on October 2, 1941, back in Atlanta they recorded the Clayton McMichen and Slim Bryant song In the Pines. CHARLIE MONROE AND HIS KENTUCKY PARDNERS recorded two of his own compositions, the favorite Mother’s Not Dead, She’s Only Sleeping and the moody Down in the Willow Garden. The first was cut in Atlanta on September 30, 1946 and the latter in Chicago on March 24, 1947. Bill Sickler joins Charlie to sing the harmony parts. J. E. MAINER AND THE MOUNTAINEERS recorded both these titles in Atlanta on August 6, 1935 in a marathon session that started at 8 AM and produced fourteen sides. Zeke Morris is heard singing This World Is Not My Home and he is joined by Wade Mainer on New Curly Headed Baby, Daddy John Love and J. E. himself filled out the instrumentation of banjo, violin and two guitars. RILEY PUCKETT was recorded alone on When It’s Peach Pickin’ Time in Georgia, another well accepted McMichen melody. The date was October 2, 1941 and the place was Atlanta. In fact, Riley’s session immediately followed the one previously mentioned by Bill Monroe. This legendary blind guitarist had earlier recorded in Atlanta, on February 5, 1940, but that time he was accompanied by an unidentified accordionist. The song When I Grow Too Old to Dream was not from the southern root source of most Bluegrass but an Oscar Hammerstein II and Sigmund Romberg success that proves an interesting example of the music form’s vast possibilities. GID TANNER AND HIS SKILLET LICKERS cut both Back Up and Push and Skillet Licker Breakdown in San Antonio, Texas, on March 29, 1934. This session, described by the producer Elmer Eades as “a rip-roaring wild free-for-all,” also produced their biggest hit, “Down Yonder,” and for almost thirty years that hit, coupled with Back Up and Push, was consistently featured on the rural jukeboxes of the south and southwest. Another LP collection of black roots music on the RCA Victor Vintage Series is presented this week, 1965's "Bluebird Blues". 16 tracks recorded 1932-1942 were dug out of the Victor vaults for this compilation featuring legendary bluesmen Blind Willie McTell, Tampa Red, Joe Williams, Sonny Boy Williamson, Tommy McClennan, Sleepy John Estes, Arthur Crudup, and Lonnie Johnson. A great title in a great series! 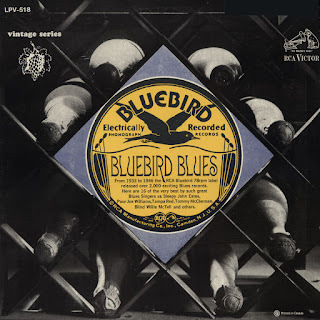 The Bluebird label first saw the light of day in 1933, during the height of the Depression, a particularly disastrous and distasteful interval in American history. But, notwithstanding this birth date, had it not been for the Depression it is entirely possible that the Bluebird label would never have come into existence at all. During the Depression, the costs of almost everything needed to produce records were greatly reduced. It soon became evident that the same product which had been in production for a number of years could now be produced at an infinitely cheaper rate. Thus the birth of the new Bluebird label of the RCA Victor Record Company which, in 1933, sold for thirty-five cents per record. In retrospect, it must be concluded that, even for those hard times, the return received was a handsome one in terms of listening pleasure and was well worth the investment. The Bluebird label was produced until 1950, and included various categories, some of which were no less interesting or’ productive than blues. There were children’s records, Cajun music, an international series, popular music and jazz, country and western, rhythm and blues, Broadway shows, and even music of India. But, unfortunately, the year 1946, with all of its attendant post-World-War problems, marked the end of blues recording for the label. Prior to this date, especially in the late 1930s and very early 1940s, recording activities were extensive and many talents were introduced for the first time. The demise did come, though, possibly as a direct result of the Second World War, the resultant “sophistication” and the change in musical tastes which inevitably resulted therefrom. The receptive audience which constituted the buying public was no longer present in the large numbers that had existed in the pre-war period. The post-war emphasis was on rhythm and blues or highly amplified offerings. Many artists gave up and dropped out of sight while those who were able to keep up with the changing times, and coincidental demands, transferred their efforts to RCA Victor recordings. Thus a memorable period in the popular music history of America ended but, most certainly, not before leaving a lasting impact and imparting a substantial legacy. By selecting the individuals presented in this anthology there has been no intention to slight the great many excellent artists who, at one time or another, recorded for the company. What is presented here is a survey of the vast expanse of material released on Bluebird. (The two sides each by Blind Willie McTell and Arthur “Big Boy” Crudup also saw the light of day on RCA Victor issues.) Since approximately 2,000 sides were released, the recordings and artists offered are considered a representative selection of the wide latitude of blues styles recorded for the label. Blind Willie McTell, who recorded as Hot Shot Willie for Bluebird and under his true name for RCA Victor, was, undoubtedly, one of the best of all recorded twelve-string guitar players—and certainly the most melodic. Originally from Statesboro, Georgia, he recorded numerous excellent efforts in the 1920s and ‘30s. He was active around Atlanta for most -his career and was known to have been there as late as c. 1960. On the two seletfons here, he exhibits his talents as both lead guitarist, Searching the Desert for the Blues, and as an accompanist, Lonesome Day Blues. Both offerings are fraught with good humor and the spoken interjections, by both Blind Willie and Kate McTell, ideally enhance the performances. One rather interesting phenomenon concerning two of the performers featured here—Sleepy John Estes and Lonnie Johnson—is that both have been recently “resurrected” after extended periods of musical inactivity. The causative factors involved in their separate rediscoveries are directly traceable to the “folk-music” boom of the 1950s and ‘60s. A direct result of this has been a renewed interest in the blues as a meaningful art form and an almost studious interest in the important performers who, via commercial recordings, shaped both the city and country styles. Estes had long been thought of as dead and, since having been found in his home town of Brownsville, Tennessee, has resumed his career as an active blues singer. His two selections include the intensely personal Lawyer Clark Blues (“he was the first man to prove that water runs upstream”) and his woman tome Little Laura Blues. Lonnie Johnson, a name long synonomous with the blues, was found doing menial work in Philadelphia, totally divorced from music. Johnson, one of the most recorded men in the entire field, has been one of the most influential of all blues singers and guitarists. Throughout his extended recording career he has been consistently good and Jersey Belle Blues and Crowing Rooster Blues are but two of his many excellent performances. On the former, his treatment of the traditional “milk-cow” theme, he is accompanied by the great blues pianist Joshua Altheimer. The latter item, one of his most popular recordings, was also reissued on the RCA Victor label. Johnson, like Estes, is once again an active performer. Both Arthur “Big Boy” Crudup, a wholly-neglected artist of substantial stature, and Tampa Red (Hudson Whittaker) are alive, although neither appears to have been affected to any great degree by the aforementioned “folk boom.” Both of Crudup’s selections are indicative of the timeless quality and inherent poetic beauty in many blues songs. Black Pony Blues has been a favorite, in one form or another, with Mississippi blues artists in particular, while Death Valley Blues, with its ominous aura, stands as a prime example of outstanding blues poetry. Tampa Red, whose extensive recording career closely rivals that of Lonnie Johnson, is a master of the bottleneck style of guitar playing. The style is characterized by wearing the broken neck of a whiskey or pop bottle, or, at times, a metal tube, on one of the fingers of the fretting hand and sliding it along the strings to create a stinging, whining effect. As an employer of this style, Tampa Red has had few peers and both selections have been pointedly included to demonstrate this facet. Don’t let the woman’s occasional shrieking on Kingfish Blues (an unwarranted intrusion) detract from the delight of Tampa Red’s artistry. Both Tommy McClennan and Sonny Boy Williamson are dead. McClennan died some years ago of (relatively) natural causes, while Williamson was murdered in 1948. Tommy McClennan was one of the best selling of all Bluebird artists, and this was undoubtedly because of his rough-hewn, “down-home” vocal delivery which was perfectly complemented by his earthy guitar playing. Bluebird Blues, an extremely popular item among the large number of Southern blues singers who moved to Northern urban centers, was his last recorded effort, and possibly his best, while Brown Skin Girl was made at his initial session in 1939. Sonny Boy Williamson, prior to his tragic death, was one of the best of all recorded mouth-harp players and, in addition, another one of the best-selling artists recorded on the Bluebird label. His musical approach has influenced a great number of subsequent bluesmen, both vocally and instrumentally, and he was, in no small way, directly responsible for the emergence of a rather impressive group of mouth-harp players. On both offerings, he is joined by mandolinist Yank Rachel who, incidentally, has also been reactivated in the past few years. Of all the men included in this survey, Poor Joe Williams is undeniably the stalwart artist for, notwithstanding the “revival” which has afforded him further employment opportunities, he has never fallen to musical inactivity. He has been an active bluesman throughout the years, and his recording history extends back at least thirty years, if not more. Williams’ Somebody’s Been Borrowing That Stuff, from his first Bluebird recording session, and Wild Cow Blues, another treatment of the classic “milk-cow” theme, are rough, almost primitive sounding, performances. On the former he appears with another excellent blues guitarist of the period, Henry Townsend, while on the latter he is accompanied by his own guitar, a washboard and a one-string fiddle—all of which contribute to a rather unique tonal result.